It is our pleasure to announce that the next JEDI meeting will take place from the 18th to the 20th of October 2012 at the hotel INATEL in the beautiful beach town of Foz do Arelho, Portugal. 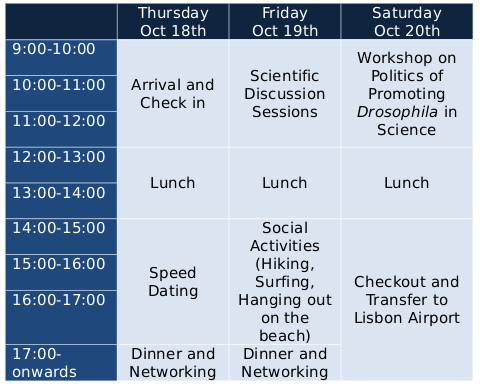 As a continuation of the inaugural JEDI meeting in 2011, the meeting will bring together independent Drosophila investigators in Europe at an early career stage and aims at fostering scientific, professional and personal exchanges in an informal setting. We want to continue the debate on how to strengthen the position of young team leaders within the established scientific community, how to create new, innovative and collaborative research structures within the new generation of Drosophila scientists, and finally on how to strengthen the awareness and support for Drosophila research within the European scientific environment. A detailed program will follow. Foz do Arelho is a charming small beach resort one and a half hours north of Lisbon surrounded by beautiful beaches and dramatic cliffs on the Atlantic Ocean. 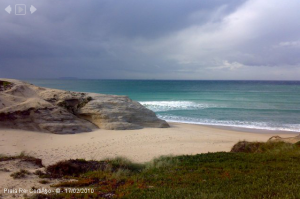 It is easily reachable from Lisbon by train and a subsequent short TAXI ride. The INATEL hotel is five minutes from the beach and very family friendly. Local activities include hiking, swimming, and surfing and the lagoon is perfect for kids. We would like to encourage people to come with family with the possibility of remaining for the weekend following the meeting. Early registration for the meeting will cost 160 euro and will cover 2 nights in single rooms, full board and coffee breaks. Travel organization and expenses will be the responsibility of the attendees. We are currently exploring additional funding possibilities for participants. The attendance is limited to 80 participants. Thanks for organizing. It is still easy/possible to go with the families? Can double or bigger rooms be requested?